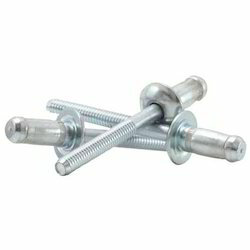 Offering you a complete choice of products which include aluminum dome head blind rivets. With our expertise in this domain, we are able to manufacture, supply and export a superior quality range of Blind Rivets Aluminium Dome Head. Excellent quality aluminum and other material are used in the manufacturing process by our experienced team of professionals. To meet diverse requirements of customers, we offer these blind rivets in various specifications.